Ayala, C.P. ; Cruzes, D.; Franch, X.; Conradi, R.
Adopting OSS products is becoming an economical and strategic need for today organizations. A fundamental part of successful adoption is the informed selection of OSS products that best fit the organization needs. One of the main current problems hampering OSS selection is the vast amount of unstructured, incomplete, evolvable and widespread information about OSS products that highly increases the risks of taking a wrong decision as well as the likelihood to deter the use of an OSS product. In this paper, based on marketing research principles, we aim to inform and provide evidence to OSS communities that help them to envisage improvements on their information rendering strategies to satisfy industrial OSS selectors’ needs. Our results are from the matching between the informational needs of 23 OSS selectors from diverse software-intensive organizations, and the in-depth study of 9 OSS communities of different sizes and domains. The results evidenced specific areas of improvement. It is a first step to raise the awareness of OSS communities and researchers on areas that are required to improve the industrial OSS selection practice. Ayala, C.P. [et al.]. 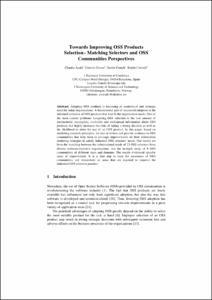 Towards improving OSS products selection: matching selectors and OSS communities perspectives. A: International Conference on Open Source Systems. "Open Source Systems: grounding research: 7th IFIP WG 2.13 International Conference, OSS 2011: Salvador, Brazil, October 6-7, 2011: proceedings". Salvador: Springer, 2011, p. 244-258.